Canon’s ERR99: What it means and how to FIX IT! ERR99: The dread of every photographer! No error on any camera is as dreaded as Error 99. If you shoot Canon and haven't seen it yet, you will. Canons certainly aren't any more prone to errors than any other camera brand, but they are a bit notorious for the infamous Error 99. Learn how to fix it now so when it happens, you aren't stuck shooting a wedding without a working camera! In short, ERR99 on your Canon camera is simply a general error. What error, you ask? That is the difficulty with troubleshooting the famous ERR99. Since it is a general error, it gives you nothing to begin with. But have no fear, I've seen the error enough times that I should be able to point you in the right direction. To fix the error, you can certainly call Canon… but I will tell you exactly what they tell you on the phone. First they will ask you to do a clean reboot, then try switching the lens, and then they will ask you to pay to ship the camera to them, wait four weeks without a camera and then cross your fingers that the repair isn't too expensive. Hopefully it won't get to that point! The following steps address the most common causes of ERR99 and offer solutions to see if it is something you can fix yourself. Read these first before you call Canon! ERR99 is a general error, but often the cause of the error is lens communication. This could be for many different reasons. 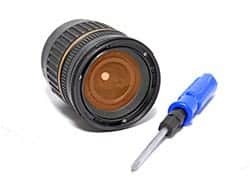 For example, if the aperture assembly on your lens is broken and needs to be replaced, the camera will tell your lens to change the aperture, the lens can't because the aperture assembly is not functioning, and so the camera will not have any confirmation that the lens obeyed it's command. The result? Error 99. Try the lens on a different camera, or try using a different lens on your Canon camera. This way you will know if the lens is causing the problem. If the lens is the problem, first attempt to fix it with step #2 and if that doesn't work, you will need to send the lens to the lens manufacturer for repair. On the back of the lens as well as the base of the lens mount, you will find a series of gold-colored metal contacts. This is how the lens and camera communicate. If either the lens or camera contact is dirty, communication will be inhibited. The way that the actual Canon repair facilities fix this problem is to use the eraser on a pencil. Lightly rub all of the contacts being careful to not get eraser dust in the lens or camera. If the contacts are just dirty but nothing is broken, this is a simple fix. I have personally seen this fix the dreaded ERR99. This is the magic tech support solution that seems to work so often, but sometimes it is so simple that we don't feel like washing in the river 7 times (catch the reference there?). Turn the camera off, take the battery out, wait 30 full seconds, put the battery in again, turn the camera on again, and take a photo. I know this sounds insultingly simple, but please try it. Tech support always suggests this fix because it so often works. Your camera actually has two batteries in it. One battery powers the functions of the camera, and the other battery powers the behind-the-scenes operations of the camera that remember your camera settings even after removing the battery, remembers the date and time, etc. One possibility is that the error concerns some function powered by this second battery. Step four is to remove two screws from the camera, slide out the tray holding this second battery, replace the battery (it looks like a simple watch battery), and then restart the camera again. More specifically, follow these steps to perform a full power cycle: (1) Turn off the camera, (2) Remove the lens and put on a body cap, (3) Remove the memory card, (4) Remove the main battery as well as the small backup battery, (5) Wait 5 minutes. I know it seems silly to wait. Off is off, right? But I have personally seen electronics work after waiting with the battery out for 5 minutes when the standard 20 seconds didn't work. (6) Put both fresh and charged batteries back in the camera, and (7) Cross your fingers that the shutter click doesn't revive ERR99. For a diagram on how to remove this secondary battery, check out this very very thorough blog post about fixing ERR99 issues. There are actually a lot of ways that you can mess up your memory card, which will assuredly cause problems with the camera. The best way to eliminate this as being a problem is to simply get a brand new card and put it in the camera to see if the problem continues after a reboot. If that isn't an option, at least try one other used card to make sure it isn't a corrupt card. Next, if you haven't been using your cards correctly, we should make sure you aren't doing something upon import of your photos that is causing errors in your memory card's database. Put the memory card in the camera and do a full reformat. Do not just erase images, go into the menu and look for “Format Card”. If the camera cannot format the card, there is a good chance the card is the issue. The phone number for Canon technical support is 1-800-652-2666 or check for more support options. If you found this post to be helpful, please subscribe to my FREE photo tips newsletter and I'll email you with my very best blog posts and photo tips. Click here.